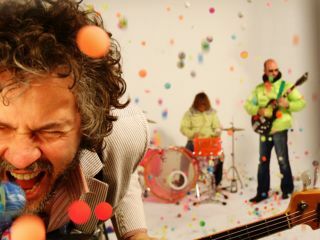 The Flaming Lips forthcoming double-album, Embryonic, will feature MGMT and the Yeah Yeah Yeahs' Karen O. The guests appear on different tracks. Coyne told Swiss website Die Klangschau this week: "I just called [Karen] up in her hotel room and we did it right over the telephone. It's pretty absurd." The Yeah Yeah Yeahs' singer appears on at least a "couple" of Embryonic's tracks. "For us, making a double record means that there's more room to be strange," Coyne added. "When [you] are making a very precise ten or 11 tracks, you want a really focused mood with an arc in it. "Whereas I think with a double record, you're allowed to be abstract, freaky and unfocused - and that appealed to us. We really wanted to have the songs overtake us." The result is a more "groove"-focused album that fans "might not even recognise [as the Flaming Lips]". Alongside cameos by Karen O and MGMT, there are also contributions from a "weird mathematician guy from Germany". He does "some spoken word stuff." "It's been very stressful because you just don't know if you're losing your minds or what - but I think for a group like us, we have to lose our minds. Because there's too much of your mind that knows how to make records." Embryonic will be released in September.